Posted in: Books. Tagged: edison, history. 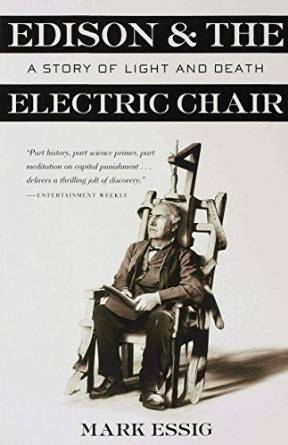 Just finished Mark Essig‘s Edison and The Electric Chair. I received the book as a surprise gift, not having heard of it before. Very glad I did. The book covers a period in American history that I knew next to nothing about — the Gilded Age and the War of the Currents. It traces Thomas Edison‘s work developing and marketing many of the key elements of the US’s electrical landscape, from the light bulb to the distribution system. Along the way, Essig weaves in elements and anecdotes from Edison’s life to paint a fascinating and nuanced picture. Essig also describes the political landscape of Edison’s time and how social movements to reduce human and animal suffering at the turn of the last century drove the search for more humane execution methods — the most common method at the time was hanging. Although I couldn’t put it down, I was a little disappointed by how light the book was on the scientific and technical aspects of the story. For instance, Essig spends many chapters on the public debate that raged during the War of the Currents over whether direct or alternating current was more dangerous (seems it’s AC). But he never really resolves the debate or explains our current understanding. So it’s really more a history of science and technology than a popular science book but still a very engaging read.